I'd never cooked a pork loin before, so I was a bit out of my element. I saw no choice but to consult my favorite butchers at the Seward Co-op. After talking about meat and smoking and the pleasures of Charcuterie, we placed an order for a 4 pound pork loin, to be picked up the next day. When it arrived, the meat was marbled and lovely, white fat contrasting against pure white fat on two 2-pound cuts. I brought it home and prepared the spice rub. I have started using a kitchen scale, a behavior that is revolutionizing my cooking life. Measuring the spices with a scale was so marvelous, so effortless, and so fail-proof, and gave me more time to enjoy the overall sensory experience. The smells, the colors, ooh la la! This rub really made me excited, a mixture of smoked paprika, coriander, cayenne, oregano, and other intense spices. I generously rubbed it over the meat, wrapped the loins tightly in a plastic bag, and placed it in the refrigerator. For the next two days, the pork tempted me each time I opened the refrigerator door (which is, I must admit, quite often). Finally, Sunday came and the pork was ready to smoke. After spending the morning and early afternoon bicycling, cleaning, and doing laundry, I was hungry for a late lunch and was excited to get smokin'. I set up the smoker, selecting maple wood chips. I thought the sweet, sappy flavor of maple wood would go well with the sweet and spicy rub and the naturally sweet flavor of pork. The smell of maple wood, spices, and pork filled the house whileI slowly ate my lunch on the porch, feeling the cool air through the windows and basking in the warmth of the spring sun. My meal was simple and delicious, brown rice macaroni with white beans, garlic, and parsley pesto with lemon and pine nuts. On the side I had a serving of Layered Rainbow Salad. But after finishing it, I wasn't satisfied. In an attempt to quell my dissatisfacation, I made an impromptu single-serving batch of chocolate pudding from coconut milk, Callabaut cocoa, maple syrup, and vanilla. Although it was delicious, I still wasn't satsified. So I made another batch of pudding and ate that too. And you guessed it. Still not satisfied. Not even two servings of chocolate pudding could do the job. It's smokin'! I wish I could somehow share the wonderful smell with you, but the image of smoke will have to suffice.Spicy smoky pork love. Can you feel a porkgasm coming on? Then, like a sign from a higher power, the timer I had set for the pork started beeping. I pulled back the cover on the smoker, revealing the pork loin. The meat was bright red and sizzling, with little bits of charred fat at each end. It smelled absolutely divine. I inserted a meat thermometer and the temperature soared to 155º. Definitely done. I pulled it off the heat and let it rest. After about 10 minutes, I gave in and sliced a bit off the end. Oh. Oh! YES! This is what I wanted. 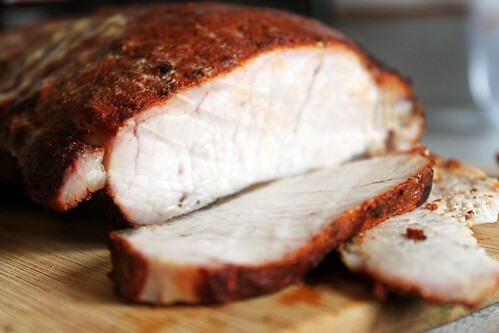 The pork was spicy and juicy, moist and sweet, smoky and salty. It was perfect. I stood in the kitchen shaving thin slices of hot pork off that loin for the next 10 minutes or so, relishing in each bite. I was more than satisfied, and went about the rest of my afternoon feeling happy. It wasn't until much later in the evening that I found myself hungry, slicing off thin pieces of the cold loin. It was still unbelieveably moist and flavorful, just as delicious cold as it was warm. Sitting alone at the dining room table, I actually vocalized my delight over the pork. Ridiculous. Since then I've been eating and sharing the pork, and everyone who tries it gets that eyes-rolling-to-the-back-of-the-head-in-pleasure look and moans just a little bit. This pork is breathtakingly pleasure-inducing. Who needs pudding? Meats are the new sweets. Ha!